It’s about time we were given another alien abduction horror. The last one I watched was ‘The Fourth Kind’ and that wasn’t exactly great, so there I was hoping that ‘Dark Skies’ would give me the dose I was craving. Scott Stewart directs Keri Russel (August Rush, Bedtime Stories) and Josh Hamilton (J. Edgar, Away We Go) as Lacy and Daniel Barrett; parents to two young boys, Jesse (Dakota Goyo – Real Steel, Thor) and Sam (Kadan Rockett). Along side struggling with financial difficulties, the Barrett’s suburban life-style is rocked by unexplained events, answering the question as to whether we are alone in the universe. The film opens with a quote by legendary Sci-Fi author, Arthur C. Clarke – “Two possibilities exist: either we are alone in the universe or we are not. Both are equally terrifying.” It’s an excellent quote to start the story with because you can’t help but think how terrifying both possibilities are, which really helps set the mood before the film even begins, it’s already got your mind working and everyone’s relatable fear pushing you to the edge of your seat. However, it is also unfortunate that they use the word “terrifying” at the opening of a film like ‘Dark Skies’ because “terrifying”… it is not. Scott Stewart just dives straight into the story, no slow introduction or eerie opening credits; we are shoved right in and introduced to our main characters. Daniel is unemployed, Lacy is an estate agent, Jesse is a young, sensitive, peer pressure-driven, Justin Bieber-looking tween and Sam is your average younger sibling. From the beginning of the film, through off-side talking between Daniel and Lacy, we know that the Barrett family are having financial difficulties, which is completely relatable to this day and age, with many families suffering the same issues due to the economy. However, it is hard to care for their issues when they are stupid enough to cut off their burglar alarm to save money, weeks before even having talks about cutting off their cable (which they never get round to doing anyway), you also can’t help but notice the big (and I mean BIG) flat screen TV they have opposite the dining room table so they can watch TV while they eat. You can argue that maybe it’s mirroring how society’s addiction to technology can distract them from the real-world threats, but seeing as how clichéd the film is, I believe it’s just a lazy script; speaking of a lazy script… they never did get that call from child services did they? ‘Dark Skies’ plays out a lot like Insidious, Sinister, The Conjuring, Paranormal Activity and pretty much every other recent horror movie about a family having unexplained paranormal activity in their home. Although it’s more Sci-Fi driven and excludes demons, poltergeists or ghosts, there is still a real sense of “been here, done that”. Obviously it all starts at night, unexplained activity starting off small and getting bigger, we also have the child that talks of “The Sandman” who comes into his room at night, and let’s not forget how they even decide to set up camera’s in everyone’s rooms; you can probably guess the rest of the film. There are no moments where you feel unsafe, the film plays it safe and just follows the usual routine, never catching you off guard and delivering few scares. The only moment that “scared” me (I use quotations marks because it still wasn’t that scary) is a scene where Lacy goes to check on her son, Sam, in the middle of the night, only to peer into his room to see a tall, slender and inhuman figure leaning over his bed. The moment doesn’t last long, resulting in a quick glimpse of the creature yet you’re still uncertain as to what you have seen, which is a nice approach, until they throw it all in your face during the final act and you get a good look at the aliens… and they look like a CGI mess. There are many stories in the media of family members who have snapped under the stress of financial issues, similar to the found-footage British drama/psychological horror ‘Exhibit A’, which is inspired by those stories. The Barrett’s suffer from those same issues; there is a sense of loss-of-control in the film, with the parents on the edge of a breakdown. 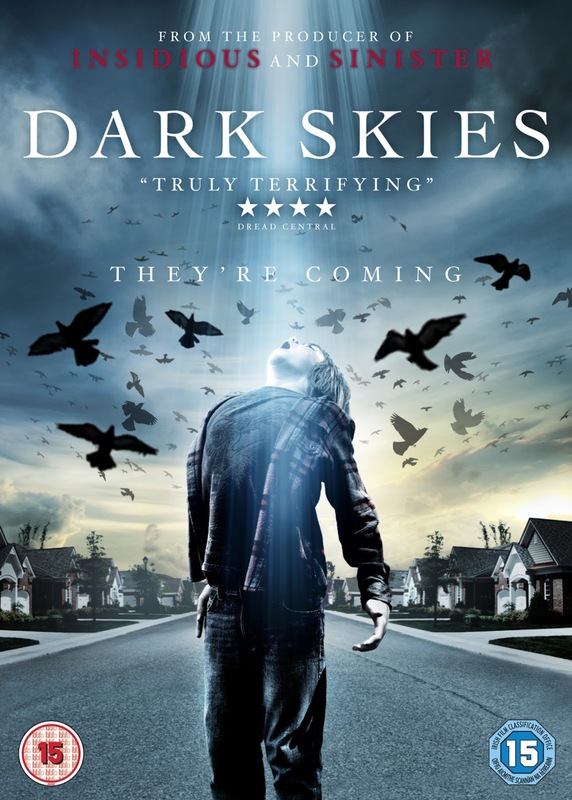 ‘Dark Skies’ could have shifted things around a bit and given us a psychological horror, shrouding the atmosphere of the film with ambiguity, not knowing whether it’s a descent into madness or something else entirely, a concept along the lines of ‘Exhibit A’ meets ‘The Fourth Kind’. Somewhere in ‘Dark Skies’ story is an intelligent concept, but unfortunately, Scott Stewart decides to take a safe route. It’s sad when the best acting in the film is given to us by someone who is in it for less than ten minutes. J.K. Simmons plays Edwin Pollard, an expert on the alien encounters, a man who has almost hidden himself away, who has clearly been subjected to so much stress and alien activity that he just seems so distant and on the edge of giving up on life. We don’t see many sides to this character at all, yet he is still more interesting than any of the main cast, and don’t get me started on the useless cop. Dakota Goyo gives us an extremely dull young teenager, although not as annoying as his in-film friend, all he manages to do is deliver his dialogue in an emotionless, mono-tone voice and give us an extremely pointless young-love relationship which supplies us with enough cheese to put off anyone who is lactose intolerant from seeing the film. ‘Dark Skies’ may not be the worst horror of 2013 (we’re looking at you ‘Texas Chainsaw’), but that doesn’t disguise the fact that it is a lazy piece of horror-cinema. Scott Stewart executes the film with a final act that tries to be intense yet instead brings on the yawns and a “twist” that was obvious from the middle of the film, however they still wish to explain it with flashbacks. In short, you’re better off sticking with ‘Close Encounters of The Third Kind’. Oh, and remember kids, dogs are for life, not just for alien invasions.